Say hello to my little friend. 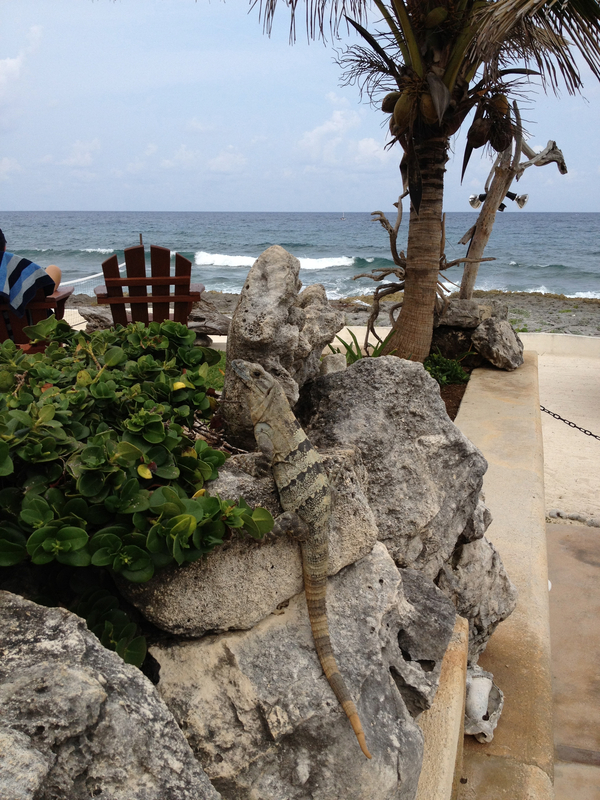 This iguana seems to prefer sitting pool side with us gringos all day. Not used to the heat and humidity of the Yucatan, I prefer sitting inside the pool all day. 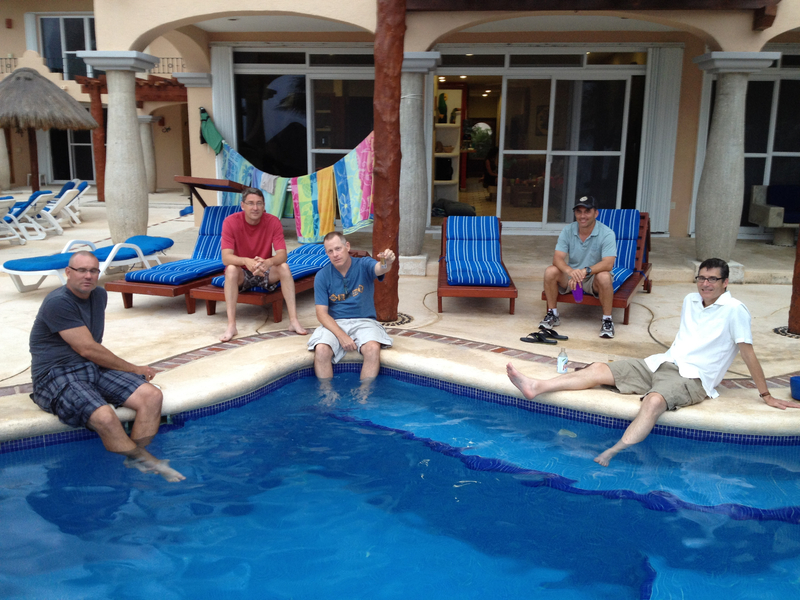 This is day 8 of my vacation in Puerto Aventuras with friends and we leave for the Cancun airport in a few hours. Day one travel was uneventful until driving out of the rental car agency. The Policia pulled us over within the first mile for a gratuitous shake down – ostensibly for not wearing seat belts but the steepness of the fine appeared negatively correlated to my ability to negotiate in Spanish. Mexico 1 – Ed 0. I tried running Sunday morning but the subsequent swelling in my left foot was enough for me to give up on that idea. There’s been no noticeable healing after a week of abstention. I suspect I’ll need to take off a good 6 weeks. 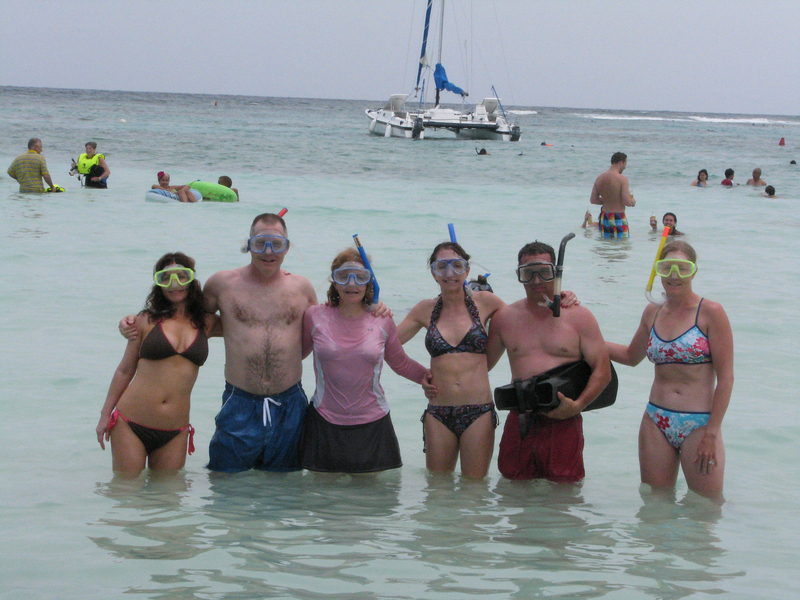 Even snorkeling with fins at Akumal stressed my injury. Really nice beach and quaint pueblo though. I saw 3 tortugas and a stingray. I picked up some nice gifts for the girls at the local shops and finished the visit with an ice cream at Lucy’s. Karen and I have been able to stay in touch with the girls via a mix of texting and Facetime. For a prorated $10 we can send and receive 50 international messages per month. I disabled all Tweets from forwarding to my iPhone along with my data feature. Brisa Caribe has decent wifi and Facetime allows us to video call Brit and Ellie. We regret missing Ellie’s 4th grade talent show but Brit recorded it and posted it to YouTube for us to watch. I also have an international calling plan but have used that sparingly since it’s still 59¢ per minute. Other than Brit, I think the only person who called me was Karl my tenant. Not sure why because I told him I was in Mexico and ended the call short. I called my mom on Mother’s Day of course. Otherwise I mostly used my iPhone to text my friends on this trip. I have absolutely no idea of where the time has gone. I mostly chilled on Sunday, exploring Puerto Aventuras by walking around, read “The Mongoliad” on my Kindle, and napped. Tina cooked us another one of her fantastic dinners – this time it was Malaysian curry. 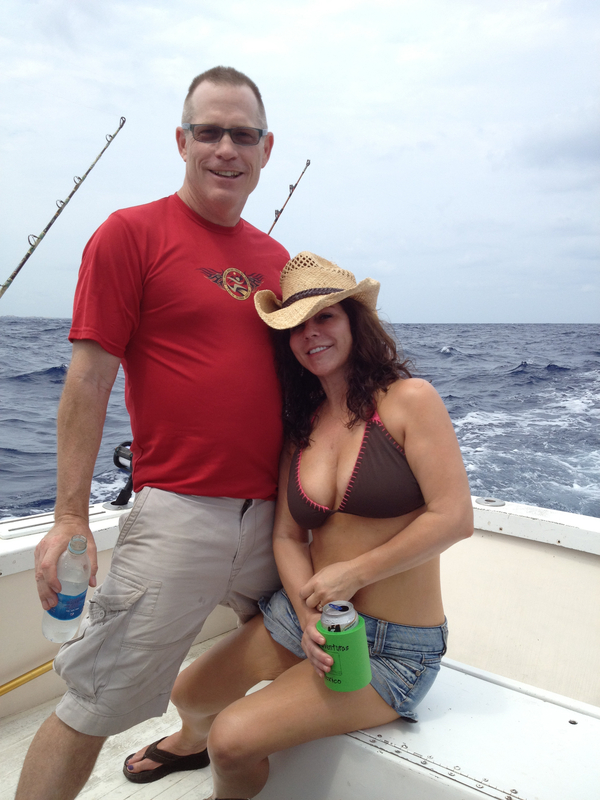 Monday included deep sea fishing. 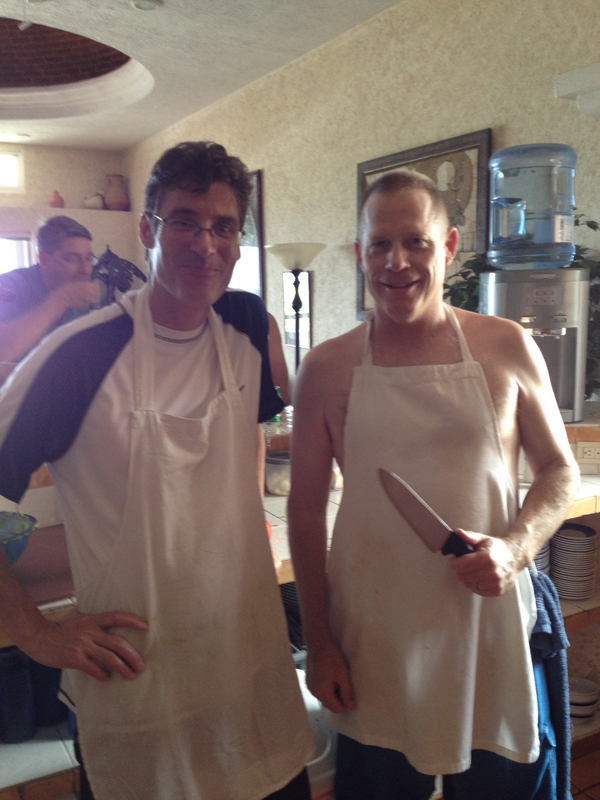 Tuesday was Akumal and Dave grilled tenderloin for us. 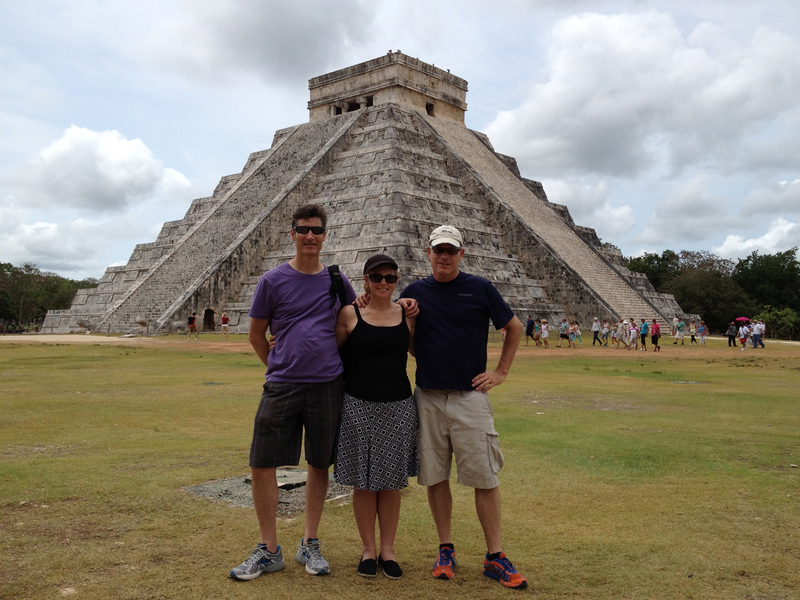 Wednesday was a big road trip to Chichen Itza with Keith and Susan. I think I hung out and read mostly on Thursday. We celebrated Keith’s 50th that night while Karen led us all in Zumba. 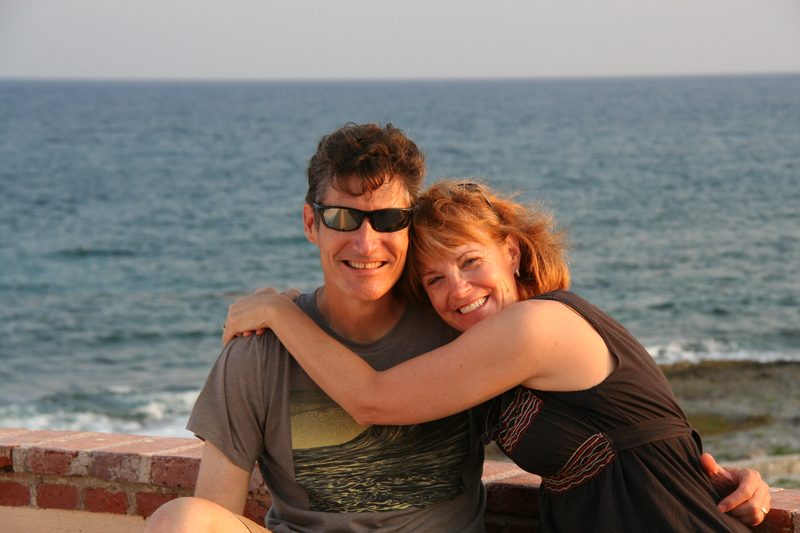 Karen and I took the ferry from Playa del Carmen to Cozumel on Friday. The Mayan ruins were so cool and certainly a highlight. 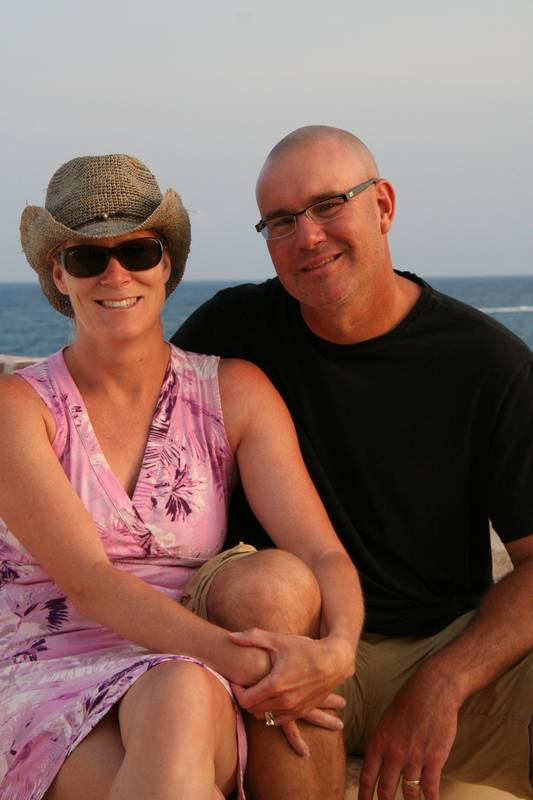 We drove a northern route through Cancun and then west on the 180 tollway. There were two tolls, one for about $15 and another for maybe $2. There was another small fee for parking and then we had to buy two tickets to enter. One from the state and another from the federal government. Apparently they don’t trust each other well enough to staff a single ticket master. We arrived early but the crowd was already fairly thick – mostly Mexican tourists. Entering was quick however and as soon as we walked inside we were within a few shorts steps of the ruins. Our Mayan guide Luis explained to us how the pyramid was an architectural calendar. The 91 steps on each side represent the days per quarter – with a final step on top for 365. The terraces count their 18 months. Tourists visit on the Equinox because of how the sun illuminates the snake that adorns the edges top to bottom. Discovering the acoustics was surprising. They bake the limestone to better bounce voices and stack them large to small stones in order to carry sound up the walls. We returned on a southern route via Tulum, stopping off in Valladolid for lunch. We took advantage of that stop to pick up a nice bottle of Mezcal from a Tequileria. I’ve only been averaging a few drinks per week ever since Moab in a vain attempt to lose weight – which has been successful. That was closer to my hourly average down here. This week, fishing was really drinking. Swimming was really drinking. Volleyball? More drinking. With that said, I rarely felt drunk. Either the beer here is hops flavored water, or I’ve been sweating out the alcohol as fast as I’ve been taking it in. I can’t say the same about the Mezcal. At Keith’s birthday party, the Mezcal flowed like wine. We polished off those 750 milliliters in 3 nights. This trip was mostly planned by Amy and Julie and I can’t thank them enough. Well, actually I think I can as Karen and I bought each of them a little souvenir salsa bowl in Cozumel. That will have to do. I suspect everyone enjoyed themselves equally. Most were religious in their morning runs. Amy and Julie were in constant facetime contact with their families. It occurs to me I might be only one without an iPad. For the most part we did everything together. Not everyone golfed. 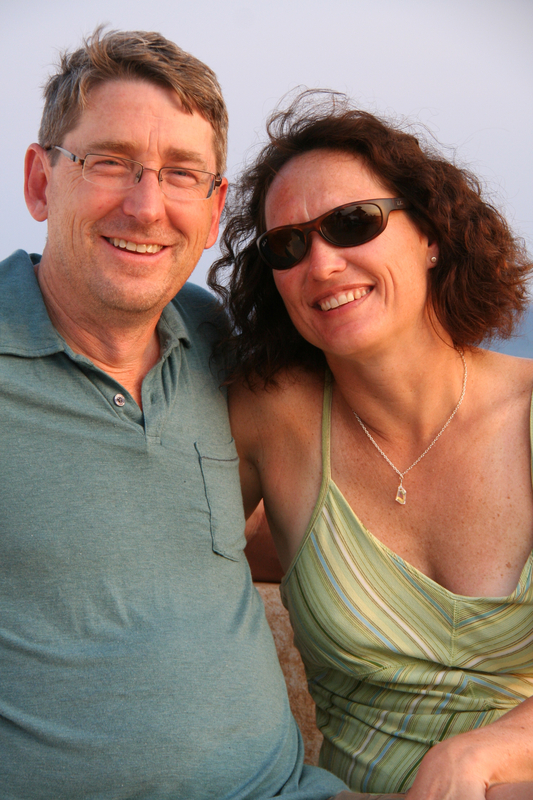 Karen and I skipped the Cenotes for Cozumel. I didn’t read as much as I thought I would. I did very little work – mostly processing email from my iPhone. This has been a true vacation. I feel bad that this trip worried my mom but fortunately the Cartels kept missing us. I can’t say enough about how nice La Brisa Caribe is and highly recommend it. Click on the link above. Doug has established the perfect vacation home for large gatherings. And take advantage of having Tina cook for you. She cost less than most meals out and her food is wonderful. We mixed up the venues, eating mostly outside. 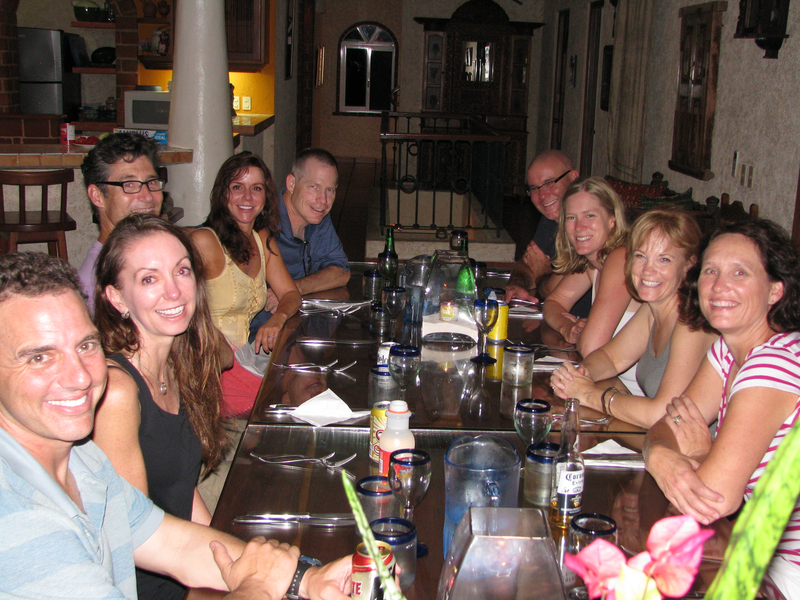 Brisa Caribe has four different settings with tables large enough to seat a dozen guests. I’m about ready to hit publish on this blog and get dressed for my last morning in paradise. We’ll have a few hours to do one final activity before catching our flights home. The adjustment back to reality will be hard but I’m looking forward to seeing my kids again. Jack too. Adios Puerto Aventuras.